Abu Dhabi National Oil Co. may sell minority stakes in some of its service units and will seek international partners as the producer of most of the crude in the United Arab Emirates seeks to boost growth and expand operations. The company known as Adnoc, which already has ventures with international companies such as Total SA at its main oil and natural gas fields, will expand its partnerships into refining and petrochemicals as well as other areas like pipelines and storage, Chief Executive Officer Sultan Al Jaber said Monday in an emailed statement. One of its services-related companies may be listed by the end of this year, a spokesman said. Middle East oil producers need to find new ways to raise cash with oil prices at less than half their average in 2014. The decline has ravaged government budgets and caused companies to cut investment in new fields and exploration. 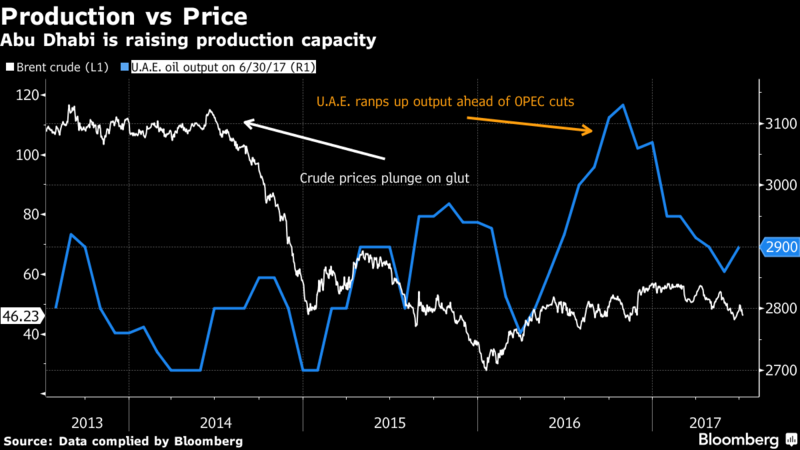 OPEC and other producers including Russia are cutting production to reduce a global oversupply. Saudi Arabia, the world’s biggest crude exporter, plans to sell a stake in its state producer next year to raise cash to revamp the nation’s economy. The initial public offering of Saudi Arabian Oil Co. could be the world’s largest share sale. Neighboring Oman is also studying the sale or IPO of some energy assets. Adnoc says its planned share sale will help bolster the U.A.E. economy and create jobs. The government won’t sell stakes in Adnoc itself and the statement didn’t specify which units would be listed. Since Al Jaber was appointed CEO last year, Adnoc has merged its shipping and ports units and combined its offshore production companies. The U.A.E. oil producer will seek foreign partners to help build its oil drilling unit and may create a division to hold pipeline and storage assets, according to the statement. New capital will allow Adnoc to “accelerate our growth, increase revenue and improve integration,” Al Jaber said in the statement. The U.A.E. is the fourth-largest producer in the Organization of Petroleum Exporting Countries. Adnoc, based in the U.A.E.’s capital Abu Dhabi, is responsible for most of the country’s 2.9 million barrels a day of output and the company plans to boost production capacity to 3.5 million barrels a day by 2018. The company is also exploring a potential $20 billion project to produce about 1.2 billion standard cubic feet of high-sulfur, or sour, gas. International companies such as BP Plc, Total and Exxon Mobil Corp. along with producers from Japan, Korea and China are already partners in Abu Dhabi’s onshore and offshore oilfields and are working to boost the emirate’s production capacity.